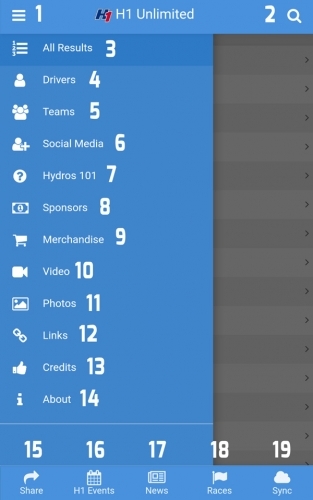 H1 Unlimited will connect with our fans and partners via a FREE app that will allow us to supply more information quicker than ever before directly to your mobile device. We will have live video from every race site, news, near real-time race results, points trackers, event & race schedules, schedule changes, race site information and other timely info that will increase your enjoyment of our events, involving you more immediately in the excitement that is H1 Unlimited. 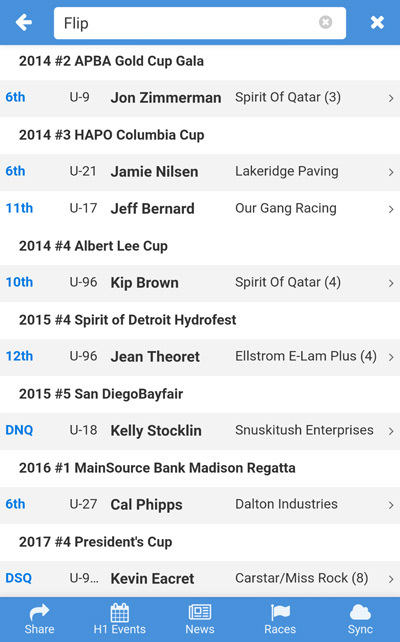 The app will be updated in real time from each race site so you will have race results within minutes of the end of each heat. If you are not attending the race, you’ll be able to watch our live video stream, putting you on the shoreline no matter where you are! When we get spectacular video from our onboard cameras, we’ll post clips right away. If our schedule changes, you’ll know it as soon as we do! 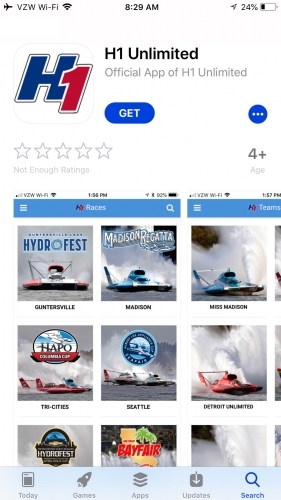 Whether you are coming out to the shore to watch the most exciting sport on water or just want to keep up with the latest news and results, grab the app and follow us in 2019! 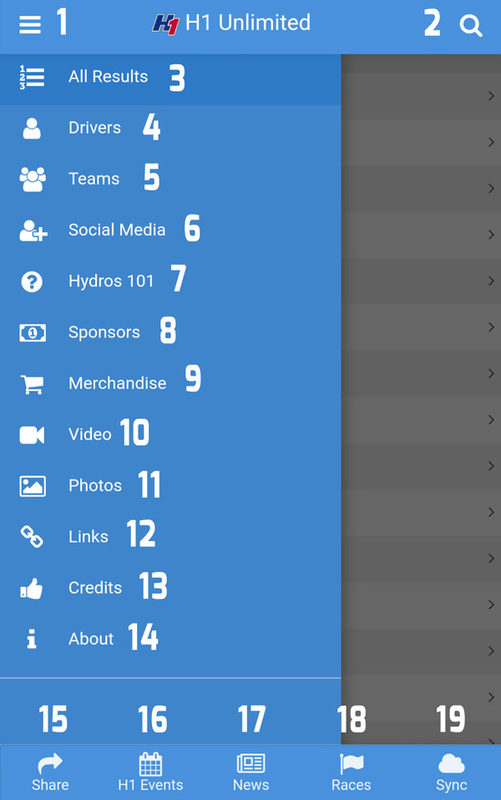 The H1 Unlimited app is designed to be easy to use, to provide as much background material as possible about our sport, and most of all, provide timely information such as news, video clips, heat finishes, points totals and schedule changes. Please note that the layout of the app may change from the off-season layout to a different layout once we start racing – some sections may change locations or be deleted, and other sections may be added. Every time you open the app, it will sync with the server, insuring you have up-to-date information. During the course of the race weekend, you should make a point of syncing it on a regular basis to make sure you get the latest news, results, videos and other information as it’s being updated. Results: See all results and podiums since the 1994 season as well as High Points tracker. Drivers: Bios of our H1 Unlimited drivers. Teams: Bios of our H1 Unlimited teams. Social Media: Facebook, Twitter, websites, etc. of H1 and all drivers, teams and race sites. Hydros 101: All aspects of Unlimited racing explained in detail. Sponsors: Please support those that help bring the sport we love to your shores! Merchandise: Click here to pick up your H1 Gear. Video: Over 2000 videos are embedded and indexed by race/heat/boat – watch every race video we know about and all of our onboard videos! Links: Fantasy Hydro league, APBA, Hydro History and Radio Controlled hydroplane links. Share: The most powerful button in the app! Sends an install link to your contacts, so you can share the app with friends, family, co-workers, etc. – it’s as simple as sending a text message! The app is FREE, so please share with everyone you know! 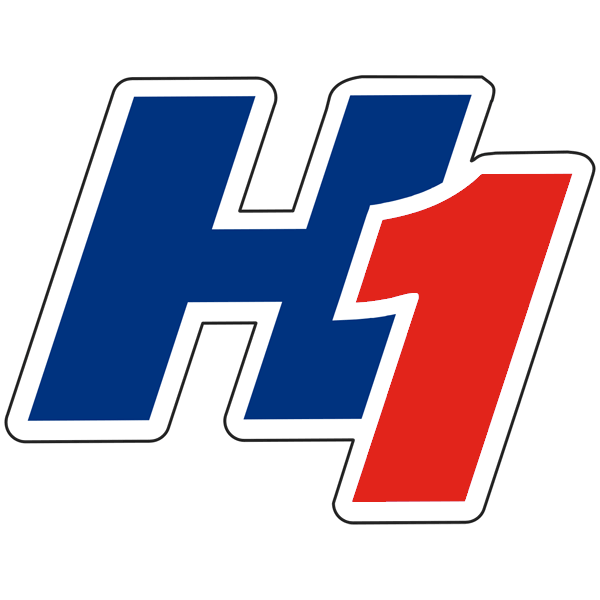 H1 Events: List of all upcoming events, including boat and driver appearances, special events, promotions and races. Basically, if we know about it, you’ll know about it! Races: Links to maps, driving directions, event schedules, phone numbers, etc. for all races on the 2018 calendar. Sync: This button “re-syncs” the app, grabbing any new information that has been posted since you last opened it. Event Info: Everything you need to at the race site. Will include maps, event schedules, site information, etc. Race Info: Everything you need to follow the race, such as entry lists, race schedule, heat assignments, points tracker, results, live video, etc. High Points: High Points tracker will fill in after each heat. Please note that some sections may be added or deleted during the racing season. Hitting the “SYNC” button may be necessary to retrieve the latest data. The most powerful feature by far is the inclusion of our video library – in the “Video” tab, we have embedded or linked to every onboard video we’ve shot and every race video clip that we could find on the internet! That’s currently more than 3200 videos! Simply view any result, and if there’s video of any type, you’ll be able to watch it! In the “Races” page, click on the race you want to visit, then the map pin, and you can get driving directions and drive times, so there’s no excuse not to come to our races! In the “Social Media” section, all of our drivers and teams use Facebook & Twitter, so here you can find out what really happened during a heat! 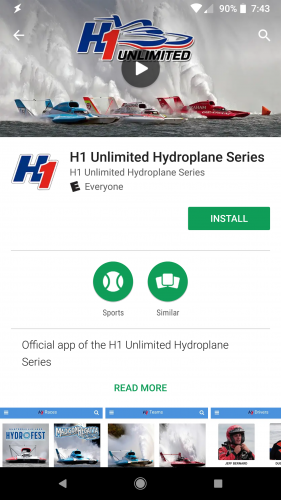 “Hydros 101” is guaranteed to teach you something you didn’t know about H1 Unlimited hydroplane racing – check it out! When we’re racing, stay on track with the “Race Info – Schedule” section – you’ll know when every heat is scheduled to run! 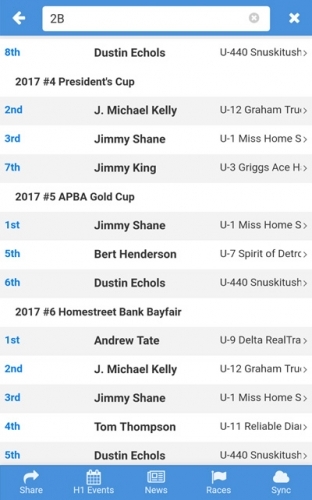 When we’re racing, “Race Info – Results” section will usually have the Official Results of each heat posted within minutes of the end of the heat, so you’ll know who won when we do! Want to see who raced in Heat 2B? Search “Results -All” for “2B” (CENTER). In other words, search for anything and the app will instantly find all instances of your search term. Want to see all of your favorite driver’s results? 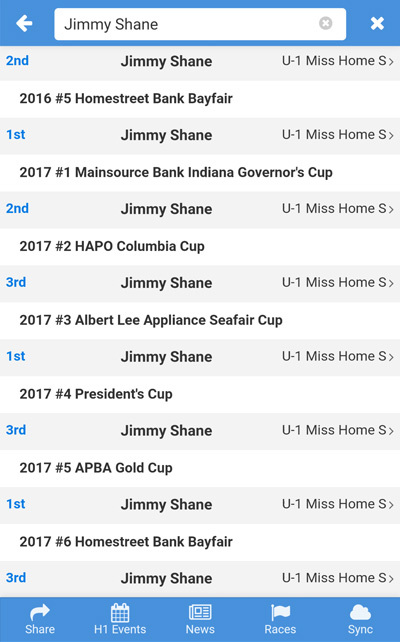 and search for “Jimmy Shane” Want to see who raced in Heat 2B? and search for “2B” Want to see the videos of our flips? Android & Apple devices treat playback slightly differently, and depending on how you want to view each video may determine which way you play them. ANDROID: If you press “Play” on the embedded You Tube video, the video will play in the app, but there will be no full-screen option, as most Android devices WILL NOT allow full-screen playback from an embedded video. To watch in full-screen mode, you will need to click on the “Watch on You Tube” link below the video in order to open the You Tube app and get full-screen playback with the ability to “cast” the video to a TV set. APPLE: If you press “Play” on the You Tube image, most Apple devices WILL allow fullscreen playback. You will only need to click on the “Watch on You Tube” link in order to get the ability to “cast” the video to a TV set. Google Chromecast (around $30) is the most cost-effective way to get You Tube videos on both Android or Apple devices to play on your TV set. Simply open any of our videos in the You Tube app by clicking the “Watch on You Tube” link, then press the “Cast” icon in the You Tube app to immediately transfer playback and control to your TV set. Chromecast also allows screen mirroring from most Android devices – it does not allow screen mirroring from Apple devices. Apple TV (around $149) functions in a similar way to Chromecast, but is more Apple-specific. Using “Air Play”, the Apple TV allows you to cast You Tube as well as mirror the screen of your Apple device to your TV set. Permissions and privacy: The only thing the app will ask permissions for are location (in order to allow you to navigate to our events or to show your distance away from our events), and permissions involved in sharing the app with friends (text, email, etc.). We will not collect or share any of your personal information.